As part of your onboarding experience, you will attend UCLA Health New Employee Medical Center Orientation, Nursing Orientation, and CareConnect (electronic health record) classes during the first week of your employment. Nursing orientation is offered the 2nd and 4th Wednesday and Thursday of each month unless otherwise specified(*). 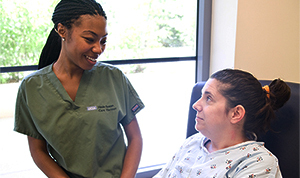 Launchpad Nursing Orientation is designed to help you learn (1) the expectations of the work environment, (2) the culture of the organization, and (3) the resources available to you. A tailored, preceptor-guided clinical orientation program follows as you transition to your department or unit. To support your transition to becoming a UCLA Health ACCP, CCP, EMT, and ER Trauma Tech, please review the documents and modules below before attending the Nursing Orientation. Contact the Department of Nursing, Research and Education at Center@mednet.ucla.edu for access to the 'secure' content.